So last Saturday I went to do a little thrift shopping for myself while we were doing back to school shopping for my little sister! She’s gonna be a freshman this year :’) where does the time go?! I hope she loves high school a lot more than I did, I remember I couldn’t wait to graduate. High school was definitely not my favorite, except art class, I loved my art classes. Before we get off track, let’s get back to thrifting. I LOVE THRIFTING!!! You can find so much cool stuff for the greatest prices! 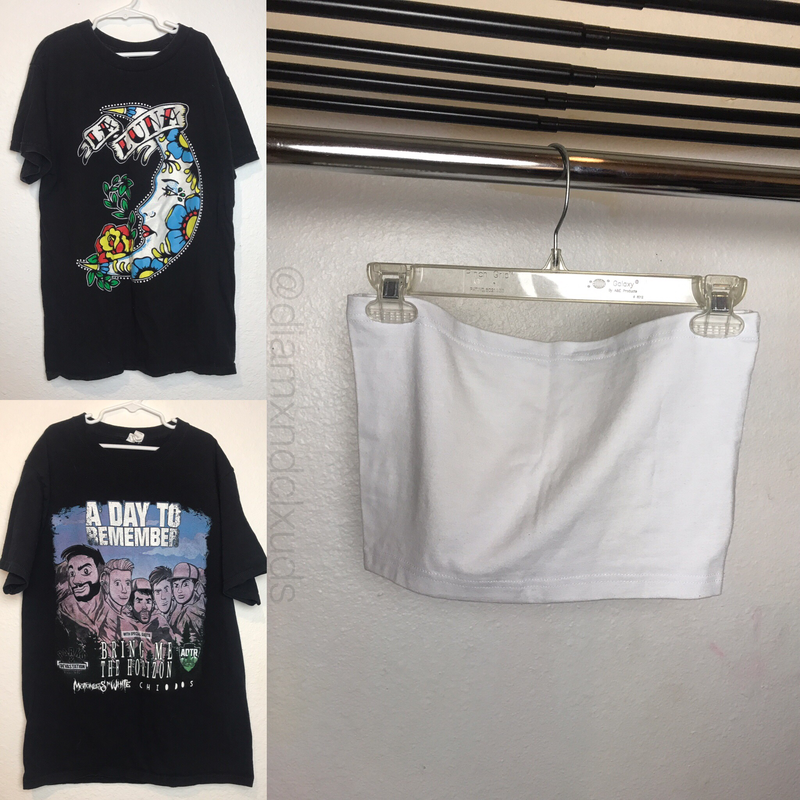 I only went to two thrift stores, and I didn’t find a whole lot of stuff; but I was pretty happy with the few things I found. The first thrift store I went to, was called Family Thrift Center, they don’t do the “color of the day” thing there. Instead, depending how much you spend can determine how much of a discount you can receive on your overall purchase the following Sunday. Which is actually pretty neat! The max you can get is 50% off but you have to admit, that’s a pretty good deal. Okay the last three items are pretty cute, I was lucky enough to find a brand new swimsuit! It had the hygienic lining on the bottoms still and the original price tags on it, so it felt pretty safe to buy it…lol The print was what initially caught my eye, and also how the pieces were kept together as a set. I mean, I love bananas and the color pink! The cut of the swimsuit was nice too, I can’t wait to slim down so I can wear it! 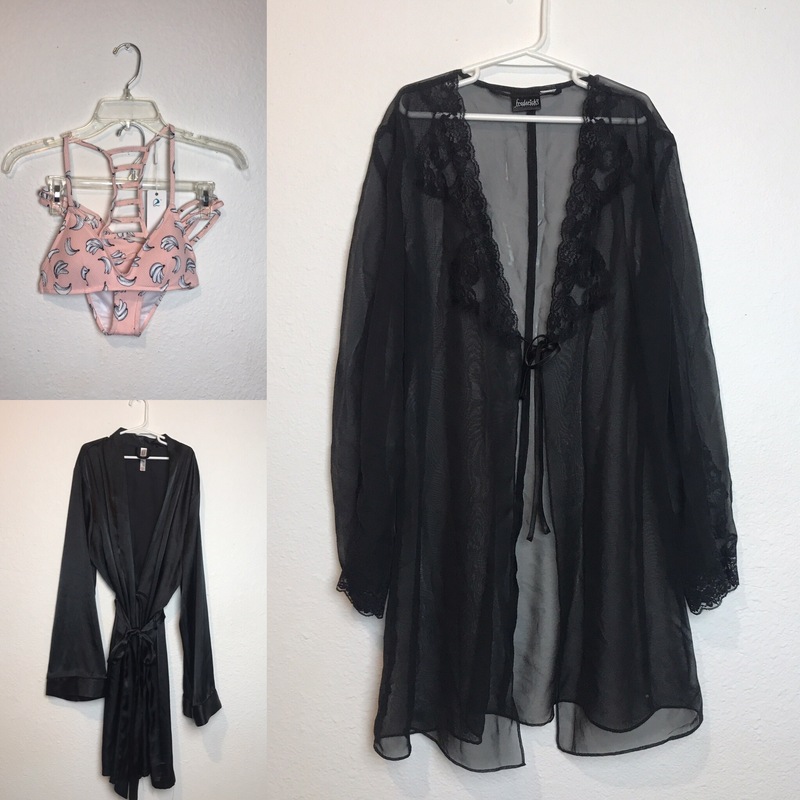 The next two items are considered sleep wear, one is a satin robe and the other is a lingerie robe. They are both super cute and I can’t wait to lounge around in them! Sipping coffee, getting ready, getting my blog posts ready to post, you know? Super cute. The satin one is from one of the brands sold at Target which is Gilligan & Omalley, and the one that looks like lingerie has a tag from Fredericks of Hollywood, and it actually looks kinda vintage…so I’m glad I got my hands on it! This thrift store we went to was the Texas Thrift Store and they usually do 2 selected colors for the day where one color is 50% off and the second color is only (20% I actually can’t remember…lol) 30% off, and on Mondays they have a selected color marked down to $1! This is probably my favorite store to go to, the deals are awesome! Since we went during the tax-free weekend and everyone was back to school shopping, they had a special sale where all the clothes and shoes were marked 50% off! That was super exciting, although also disappointing since I didn’t find much…but their normal sales are still cool enough to go shopping anyway! Well, this concludes my small thrift haul, I know it wasn’t much. However there’s always next time! Hopefully I can find some more cool stuff on my next trip thrifting.